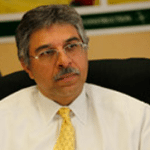 Chairman, Indus Motor Company Ltd.
Mr. Ali S. Habib is the chairman of Indus Motor Company Limited (a joint venture of the House of Habib, Toyota Motor Corporation, and Toyota Tsusho Corporation of Japan). He also heads and oversees the operations of the House of Habib (HoH). HoH is a conglomerate of companies employing over 15,000 people. Its interests range from automobiles to auto-parts; ceramic tiles to packing materials; and chemicals. The group has four publicly-listed companies. Mr. Ali S. Habib is the founding chairman of the Young Presidents Organization, Pakistan Chapter, and chairman of the Pakistan Business Council. He is also serving on the Board of Governors of Shaukat Khanum Memorial Trust.